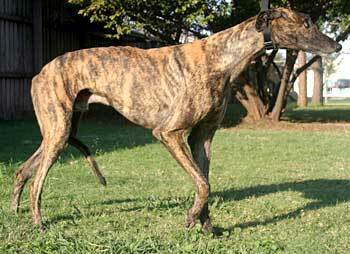 Eager, aka Fervently Eager, is a handsome, 4½-year-old brindle male born June 24, 2003. His sire is Flawless Start and his dam is Student Princess, an Irish brood. Eager was an owner release to the Tri Cities Shelter. 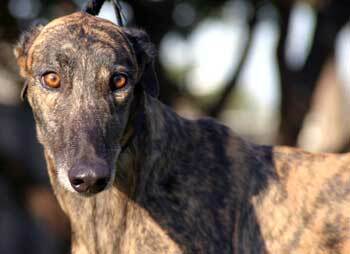 He has 79 races to his record, starting July 16, 2005, at Gulf Greyhound Park in La Marque and ending on February 18, 2007, at Corpus Christi Greyhound Track. Eager is now in a foster home with cats. He was a little interested in the cats, but was easily dissuaded when Molly bopped him on the head a few times and hissed at him. After a few days in the house he pretty much ignores them now. He is still curious when they run down the hall, but he just wants to see if he can play with them. Eager is such a sweet, loving boy. He is leery of new things but usually overcomes that with his curiosity. However, at this early stage, Eager is not eager to be around men. Updates on that will follow. 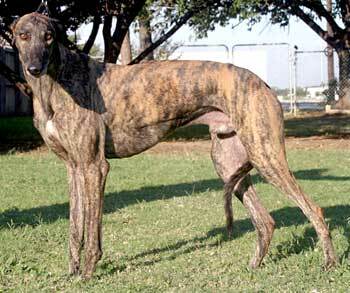 Eager was okay with three Italian Greyhounds, so should be okay with small dogs. He basically ignored them, but there would need to be the normal precautions and training as always. 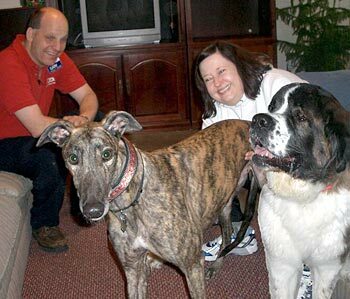 Eager with his new dad, mom, and sister Elle. He has a kitty brother and sister, too.